So I woke up in a bit of a weird mood this morning. Nothing specific, just feeling a little detached at the moment. Shoulda taken an extra Omega ;) I guess that's why I'm listening to Snow Patrol today. I was thinking, i never bothered to explain where the blog name & logo came from. They weren't a shining light of inspiration when I decided to start blogging again. They're a name & logo I came up with years ago (mid 2003 - early 2004, the name was easy but it took quite a while to come up with a logo I felt suited it). Originally it was supposed to be for a clothing company, and one day that still might work ... But in the mean time, I felt that some of my sheer logo brilliance was going to waste and I wanted to use it. The blog seemed like a perfectly appropriate place to show it off to the public. So it's copyrighted to me, obviously. 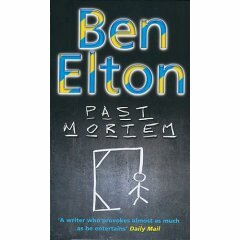 Oh, on the weekend I finished reading Ben Elton's Past Mortem. With old friends like these, who needs enemies? It's a question short, mild mannered detective Edward Newson is forced to ask himself having in romantic desperation logged on to the Friends Reunited website searching for the girlfriends of his youth. Newson is not the only member of the Class of '86 who has been raking over the ashes of the past. As his old class begins to reassemble in cyberspace, the years slip away and old feuds and passions burn hot once more. Meanwhile, back in the present, Newson's life is no less complicated. He is secretly in love with Natasha, his lovely but very attached sergeant, while comprehensively failing to solve a series of baffling and peculiarly gruesome murders. A school reunion is planned and as history begins to repeat itself, the past crashes headlong into the present. Neither will ever be the same again. In Past Mortem, Ben Elton - previous winner of The Crime Writers' Association Gold Dagger Award for Popcorn - delivers both a heart-stopping thriller and a killer comic romance. I read some bad reviews on Amazon about it, but I quite enjoyed it. True, it had some hectic bits and true, I managed to predict whodunnit well in advance. Although he did occasionally make me wonder if I'd guessed correctly as I read but, I did. It was a fairly quick, easy read. I still liked it. Admittedly my fav book of his so far is High Society. I think the best book I've read this year was definitely a "surprise entry". It arrived at our book club and didn't sound any more or less impressive than any other book. But once I started reading it, I was hooked. It is a definite can't-put-down book and is brilliantly written. It is also one of the most frightening things I've read - and books don't scare me. 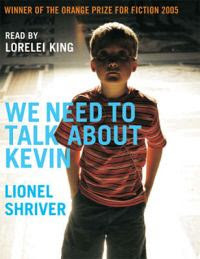 It was We Need To Talk About Kevin by Lionel Shriver. Quick warning, it may put you off kids for a bit ... which at this point in my life doesn't bother me one bit. So, that's enough for now. Didn't get up to anything too exciting last night. Was supposed to meet up with a good friend from Durbs (SB of pub-golf fame) but, he's up on work and had to hang out with work people. Boring. Oh well, I did get to see him last time he was up which was only a few weeks ago so we are pretty well caught-up for now. And Bean had dinner with his dad who also happened to be up on business. No plans for this evening yet, but looking forward to Tuesday being my next work-day :) So it should be a good weekend!